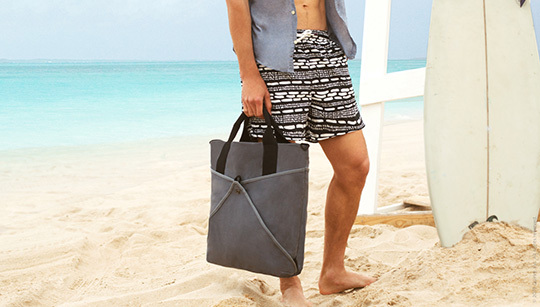 What to pack and wear when heading out for some sun, sand, and sea. Summer is here, and hopefully you'll find yourself lounging along one of the coasts at some point in the next few months, so it’s a good idea to be prepared! Although this piece is primarily targeted towards beachwear, many of the pieces are also perfectly suitable for use along the poolside. Whatever you end up doing over the summer, you’ll likely be getting wet, so make sure your closet is ready. Your choice of swimwear is by far the most important part of your trip to the beach. You'll be in your trunks all day long, so they have to be comfortable and maintain a wide range of motion while still being stylish. They should also dry very quickly, allowing you to jump between the beach and the city with relative ease. Modern trends dictate that your swimwear should end a few inches above the knee, baring a bit of thigh. If you aren't comfortable with this, it's fine to go down to the knee, but don't let it dangle over — that restricts movement and contorts your silhouette. So, look for shorts labeled with a 6-8″ inseam, going up to 10″ maximum. Adjust according to your height: longer legs require a longer inseam. Also, if you're feeling tenacious, try out a suit or two with bright colors and striking patterns; remember, this is the only piece of clothing you'll have on in the water, so there's no risk of clashing. Versatility is touted as a distinguishing feature in other forms of apparel, but swimwear is an entirely separate category – if you wear nothing else with it, versatility can be mistaken for boredom. Take a look around at the brands below and see if you find any designs you like, and remember, be expressive! You never know when your day at the beach will turn into a stroll along the boardwalk or a night on the town, so it's a good idea to pack or wear something socially acceptable just in case you don't spend the entirety of your time in the water. Plus, if you're a little self-conscious, an extra layer on top can add a lot of confidence. The single most important aspect of such a shirt is quick-drying capability — you'll likely be tossing it on while you're still slightly wet, and perhaps within splashing distance of the water, so it'll get soaked at some point. Wet t-shirts stick to your skin and trap heat, and just generally feel uncomfortable. As a result, you should consider purchasing an althetic shirt intended to wick sweat and dry as quickly as possible. They should also be lightweight; obviously, t-shirts rarely weigh much anyways, but it should feel unrestricting and be easy to toss into your tote bag before heading for the coast. Tank tops are a great idea if stepping outside feels like opening an oven door, but they're inappropriate for night wear and can be regionally awkward. For example, tank tops are the de facto uniform on the southern coast of California, but more traditional beach towns tend to disapprove of them. Regardless, they're great for the dead of summer, and because they have less surface area, dry even quicker. It's an ideal choice if you plan on changing afterwards and just need something on top to get there in the first place. They're also fantastic for layering and keeping cool. 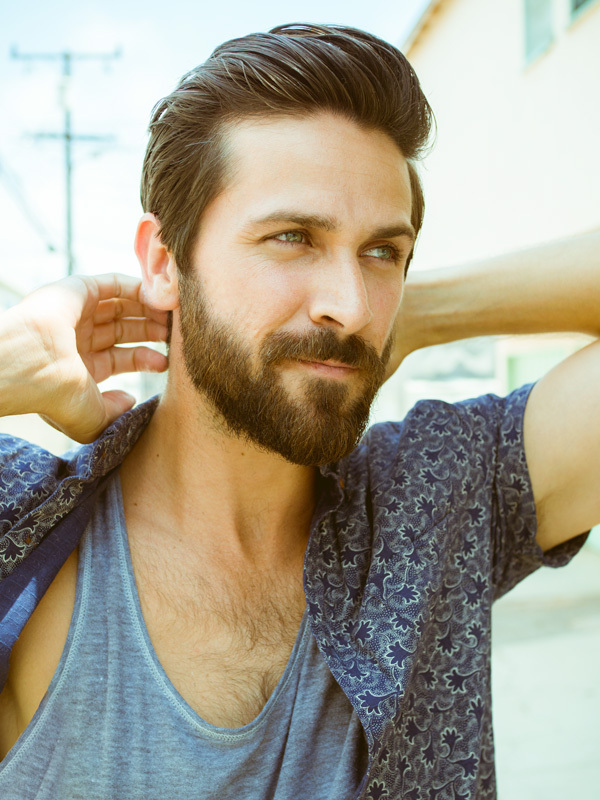 Throw on an unbuttoned short sleeve shirt over top when you walk off the sand. They're helpful for gents who don't feel comfortable going shirtless or with an open button up shirt. Given the sandy conditions, beaches may not often conjure images of shoes, but you must account for the transit there in the first place. The easiest choice is flip-flops — they're cheap, readily available, and very effective for their intended purpose. 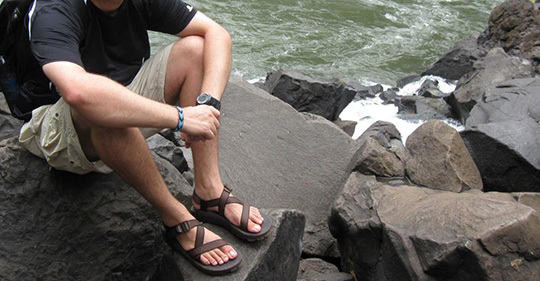 Since you'll only be wearing them for a short period of time, they'll likely be stashed away during the duration of the trip, so their low profile is perfectly suited for transportation. Furthermore, their rubber construction is easily cleaned, an important attribute for beach attire. Also, here's a tip: keep some baby powder in your bag or car. Once applied, it removes the moisture from your skin, so the sand falls right off. Easy cleanup! The combination of salt (or chlorine), sand, and water will wreak havoc on your hair, and any product you use will obviously be washed away. Needless to say, it’s not easy to have a good hair day at the beach, so it’s good to have a backup. Baseball caps are an excellent option, offering many benefits in addition to hiding your messy mop. Firstly, they keep the sun out of your eyes, which can work in conjunction with sunglasses to keep you free of eyestrain. At the same time, the cap helps to prevent sunburn on your scalp, ears, and face – if you have fair skin or thinning hair, this can be a major benefit. While your hair is drying, moisture will be wicked to the surface, keeping the most important part of your body cool. 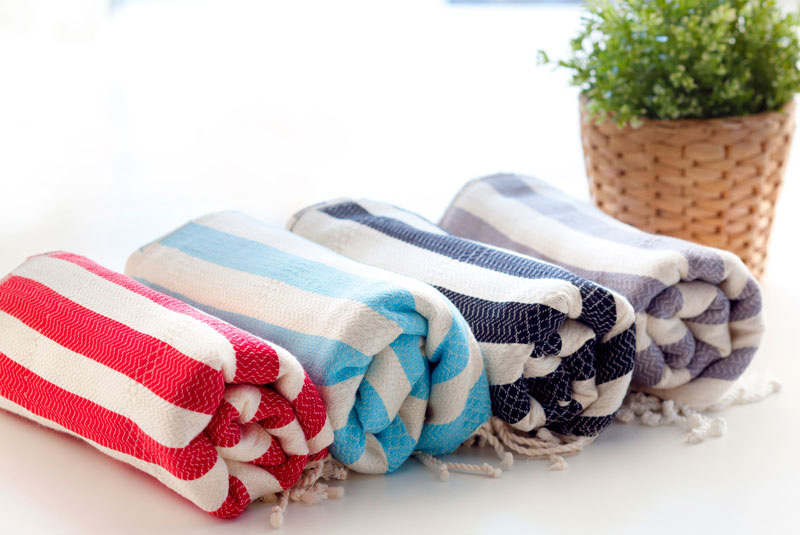 Odds are fairly high that you’ve been using the same cheap, raggedy beach towel for many years; obviously, it’s been doing its job well enough, and you wouldn’t miss it if it were stolen or irreparably damaged. Still, wouldn’t it be nice to inject a bit of luxury into your coastal visits? You’ll be using a towel all summer long – if you used any of your other garments that often, you’d probably drop a bit of additional cash on them to make sure they’re extra special. In this case, your towel is responsible for a great many things: keeping you dry, saving your spot, and creating a comfortable place to rest. A tattered old towel will leave you soggy for the ride home, and if it doesn’t stand out in the sea of people, you’ll have trouble finding your way back to your seat. These features don’t necessitate high prices, but unique designs will always be a bit more expensive. One thing most people don’t consider when buying a towel is its material composition. While most are 100% cotton, you will frequently run into synthetic blends, which might perform better or worse depending on its ratio. One of the single best materials to look for is linen; it retains even more water than cotton without feeling wet, breaks in nicely over the summer, is exceedingly durable, and allows air to flow through on hot summer days while still keeping you dry. Even a bit of linen blended into a regular towel will make a difference, and while it is more expensive, you should carefully consider its possible benefits. You will also run into bamboo and even wool, each of which has their own advantages and disadvantages. Before buying a towel made of an unknown or mysterious material, do a bit of research and confirm that it is right for your needs. 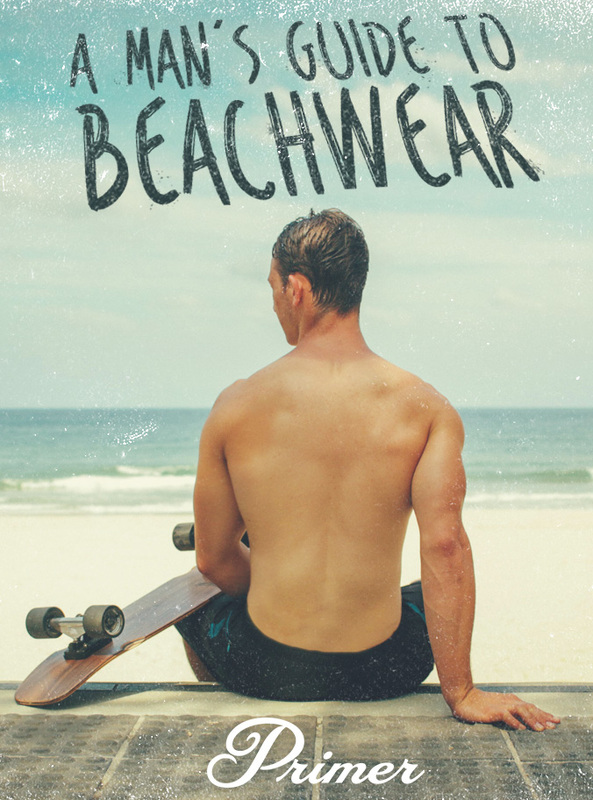 Do you have a favorite beach item or brand? Keep the list going in the comments! Live Action Getup: Be the Coolest Uncle at the Family Reunion – Including a Triple-crossing H20 War Plan! I love that men’s swim trends are leaning more towards shorter trunks. So much more attractive. I thought women found the shorter ones attractive… That’s why I only wear Speedos now. The most comfortable swim trunks I have ever worn are the Southern Marsh Dockside Trunks. I have two of them and don’t plan on buying anything else. They’re pretty easy to find in the south at men’s “boutique” stores. Bunch of color options. Good to know that linen holds waters better then cotton. For caps, I stick with ’47 brand, because who needs a wool cap on the beach? Where is the bag from in the last picture?